WASHINGTON – More than 5,000 unaccompanied immigrant children were sent to Arizona for processing by Customs and Border Protection this summer, but fewer than 200 of them ended up staying in the state. That’s less than 1 percent of the 30,340 children who were processed and placed with sponsors – typically a family member – by the U.S. Office of Refugee Resettlement between Jan. 1 and July 7, according to the most recent numbers from that office. Arizona ranked 26th among states for the number of children placed in the state, as the federal government has grappled with a surge in unaccompanied minors apprehended at the Southwest border. The state received 186 of those kids. Texas led all states for placements this year, with 4,280 unaccompanied children, followed by New York, California and Florida. Experts said that the low number of placements in Arizona points to the relatively small population of Central Americans living in the state. “Given just the basic demographic distribution of those communities, Arizona is not a major Guatemalan, Honduran or Salvadoran place of destination,” said Luis Plascencia, a professor at Arizona State University’s School of Social and Behavioral Sciences. From Oct. 1 through June 30, more than 43,000 unaccompanied immigrant children from Guatemala, El Salvador and Honduras showed up at the U.S. border, mostly in Texas. Under current law, children from Central America who are caught in this country illegally have to be screened by Customs and Border Protection and are then supposed to be turned over to the Department of Health and Human Services within 72 hours. Once there, the Office of Refugee Resettlement is responsible for care of the children in HHS shelters, until a family member or another sponsor in the United States can be located. The child is then put in the sponsor’s care for the duration of his or her immigration proceedings. The surge of children overwhelmed Border Patrol facilities in Texas, forcing the agency to move children to facilities in other states for processing, including Arizona. The agency sent 5,479 children to a processing facility in Nogales between May 31 and July 22. As Border Patrol caught up on the backlog of cases, however, it was able to stop shipping children to places like Nogales. Most of those children have since moved on, and moved out of the state. “Most of those kids get placed usually with a family member in the U.S. if one can be identified, and there’s very few Central Americans in Arizona,” said Marc Rosenblum, deputy director of the U.S. Immigration Program at the Migration Policy Institute. “What you would expect is that most of these children would end up in the states that have a lot of Central Americans living in them,” Rosenblum said. Arizona is not one of those states. Just 0.9 percent of the Central American-born population in the U.S. is in Arizona, while people from Guatemala, El Salvador and Honduras made up 3 percent of the state’s foreign-born population in 2010, according to the Census Bureau. “Less than 1 percent of the Central American-born immigrants in the U.S. are from Arizona so it’s not surprising that less than 1 percent of the placements are being placed there,” Rosenblum said. 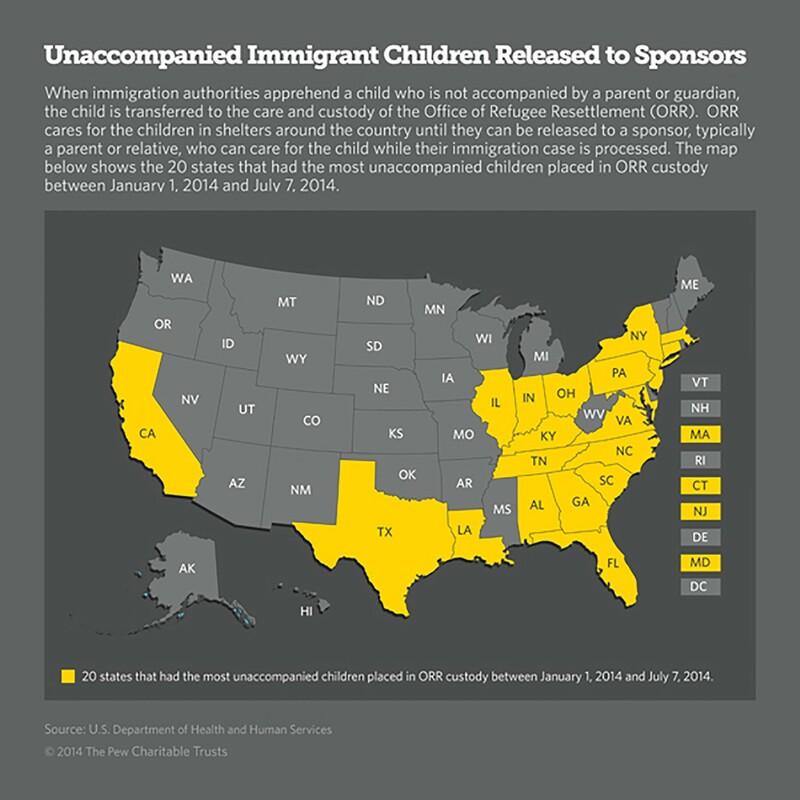 A map produced by Stateline, part of the Pew Charitable Trusts shows the 20 states in yellow that have received the highest number of Central American immigrant children. Arizona, with 186 such children, ranked 26th among states. 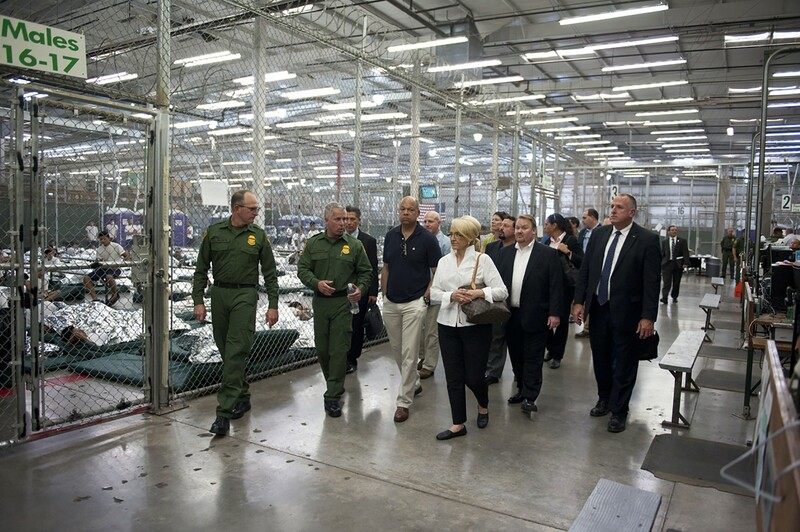 Homeland Security Secretary Jeh Johnson and Arizona Gov. Jan Brewer toured the Department of Homeland Security's Nogales center for processing immigrant children in June. 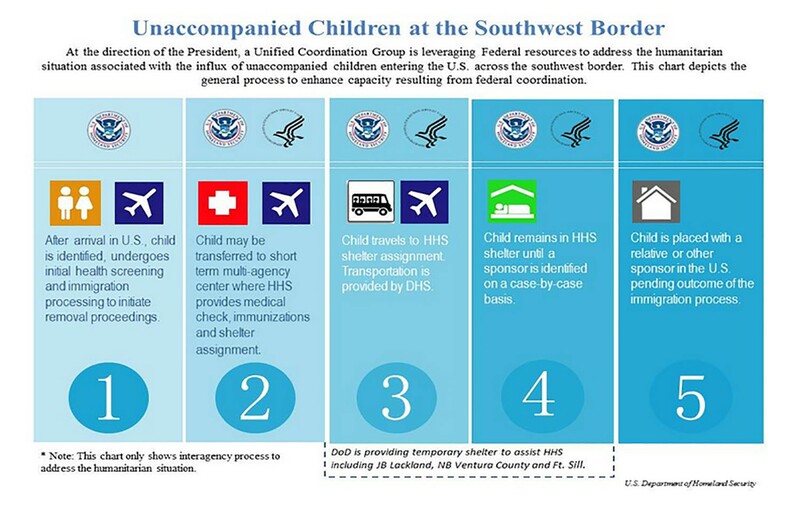 The center is no longer processing unaccompanied minors. 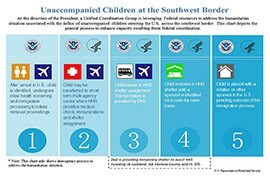 The Department of Health and Human Serivces outlines the process for handling unaccompanied minor immigrants caught illegally in the U.S., from apprehension to placement with a sponsor.